This all-inclusive five-star resort is the perfect choice for fans of scuba diving and snorkeling, as well as lovers of kayaking, windsurfing or sailing. The staff includes a team of certified divers who are on hand to help you discover all the wonders the reef has to offer. The time to relax. Those who want to rediscover the concept of peace while on vacation in the Dominican Republic will find at the Iberostar Costa Dorada hotel a modern spa where you can enjoy treatments, massages, Jacuzzi's or steam baths, among other amenities. Step into a breezy and cozy room that genuinely embodies beachside relaxation in Puerto Plata. 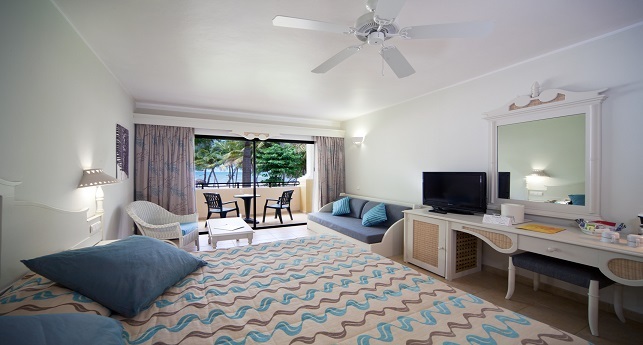 With a fun color palette and distinctly Caribbean furnishings, you’ll enjoy every second spent in your room. Complete with modern day amenities, this all-inclusive room is made especially for guests who want to have-it-all. The Double room includes your daily necessities for a truly relaxing stay. Find a digital safe, flat-screen TV, alarm clock with radio, minibar, coffee maker, and ironing tools. Bathroom amenities include a vanity sink, shower and bathtub combo, and a hairdryer. Complimentary WiFi: Stay connected with wireless internet in your room. Iberostar Costa Dorada offers a welcoming atmosphere unparalleled to any other - discover the reason why with a stay in our Double Superior room. Situated conveniently near the beach for those who want to spend every second on the golden coast. The Double Superior room includes your daily necessities for a truly relaxing stay. Find a digital safe, flat-screen TV, alarm clock with radio, minibar, coffee maker, and ironing tools. Bathroom amenities include a vanity sink, shower and bathtub combo, a hairdryer, and cozy bathrobes with matching slippers. Complimentary WiFi: Connect your devices anytime with our wireless internet. Welcome Gift: Find a gift from Iberostar upon your arrival. Relaxing Services: Nightly turndown service with aromatherapy to help you get a great night’s sleep. Iberostar Costa Dorada presents this spacious 377 sq. ft. suite composed of two connecting rooms making it ideal for families. 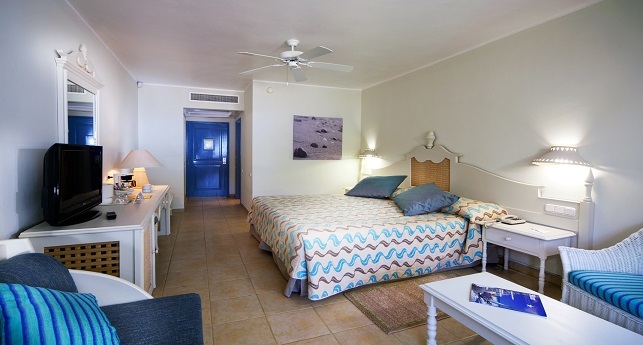 This suite contains 2 double bed and a private balcony with a garden view. Is is conveniently located in proximity to the kids club. The Family Room must have a minimum of 3 paying adults. The Family Room features a digital safe, telephone, LCD TV, alarm clock with radio, air conditioning, ceiling fan, telephone, coffee maker, iron and an ironing board. Bathroom amenities include vanity sink, shower/tub combo, and hair dryer. Childcare service: Enjoy one complimentary evening babysitting session for children ages 4-12 until 10 p.m. once per stay. Minibar: Enjoy beer, soft drinks and bottled water, as well as a selection of flavored water and snacks. Toys for children: Keeps the kids entertained with a PlayStation in the room. Imagine drifting off to sleep with the soothing sounds of the ocean waves crashing against the shore. From the balcony of the Double Sea View room enjoy the picturesque view and calming rhythm of the shining Puerto Plata beach. Thoughtfully decorated and impeccably styled, the atmosphere in the room is serene - the perfect place to be after your adventurous days. The Double Superior room includes your daily necessities for a truly relaxing stay. Find a digital safe, flat-screen (or LCD) TV, alarm clock with radio, minibar, coffee maker, and ironing tools. Complimentary WiFi: Connect at any time with our wireless internet. Relaxing Services: Make time for relaxation with complimentary access to the wet areas in SPA Sensations. An unbeatable view awaits in this exceptionally located room. Have the sparkling sea right in front of you and take in the golden stretch of sand, the swaying palm trees, and the endless bright blue sky. 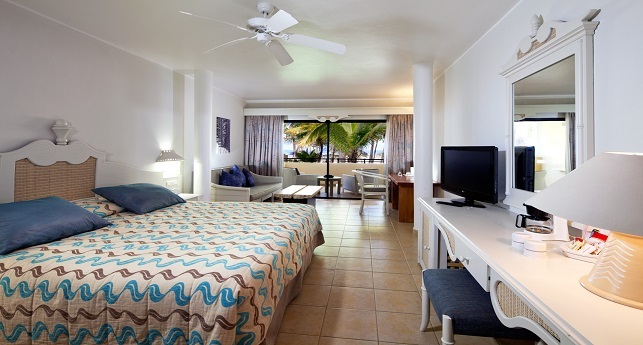 Distinctly Caribbean accents with modern all-inclusive amenities combine to create the perfect getaway room. This is the true definition of beachside relaxation. The Junior Suite Sea View room comes with a digital safe, flat-screen (or LCD) TV, alarm clock with radio, minibar, coffee maker, and ironing tools. Bathroom amenities include a vanity sink, shower and bathtub combo, a hairdryer, and soft bathrobes with matching slippers. Maximum occupancy 2 adults + 2 children and 3 adults + 1 child in existing beds. A stay in the Double Garden View room guarantees the all-inclusive experience in Puerto Plata you have always dreamed of. 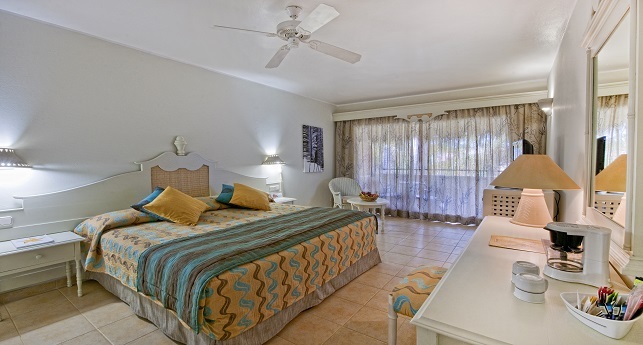 It’s common for a warm rush of happiness to fill your body when you take a look at the lush and abundant garden from your balcony An airy room filled styled to Caribbean perfection, will be the backdrop to your favored vacation memories. The Double Garden View room includes everyday amenities such as a digital safe, flat-screen TV, alarm clock with radio, minibar, coffee maker, and ironing tools. Complimentary WiFi: Connect your electronics to complimentary wifi. Welcome Gift: Look forward to a little surprise waiting for you in your room. Your search has come to an end, the perfect room awaits you at Iberostar Costa Dorada. At every sunrise, the perfect lake scenery will reveal itself to you from the comfort of your private balcony. Delight in modern amenities, excellent services, and the coziest bed you have ever sunken into. This all-inclusive enclave will surprise and delight you repeatedly throughout your stay. The Double Lake View room includes a digital safe, flat-screen TV, alarm clock with radio, minibar, coffee maker, and ironing tools. Complimentary WiFi: Keep in touch with friends and family with our high-speed wireless internet. Welcome Gift: Waiting for you in your room will be a delightful surprise from Iberostar. You’ll find it hard to resist jumping into the water with this room’s view and proximity to the pool. This well-appointed room comes equipped with all of the essentials and the special extras that make a stay at Iberostar memorable. 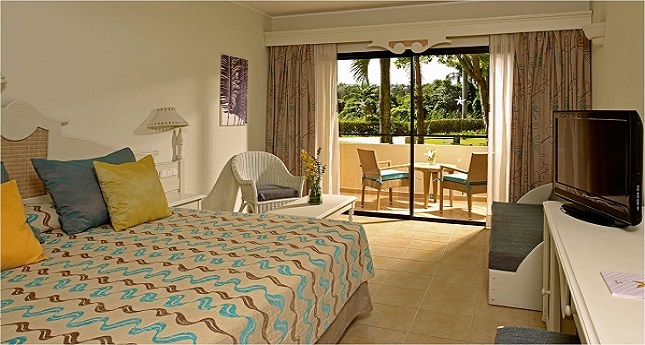 However you wish to spend your days in Puerto Plata, this room will feel like the perfect retreat to rest. Views, comfort, and style have combined to give you the all-inclusive paradise you have always dreamed of. The Double Pool View room provides amenities used regularly. Find a digital safe, flat-screen TV, alarm clock with radio, minibar, coffee maker, and ironing tools. Complimentary WiFi: We know you have to share your vacation pictures with your loved ones and our wireless internet is there to help you do so. Welcome Gift: Discover a little something from Iberostar upon your arrival. For the guests who want more out of their stay, experience Star Prestige at Iberostar Costa Dorada. Spend your days lounging on Balinese beds, and sun loungers found exclusively in the private beach area reserved for Star Prestige guests. When you are ready for a meal book through the concierge for priority reservations at all specialty restaurants. At night, our hotel staff will provide a turndown service to prep your room for a great night’s sleep. Each room is outfitted with traditional and elegant decor that creates a welcoming atmosphere. Pair this with in-room upgrades, superior services, and access to exclusive lounges, and you have a successful getaway. All that you love about your all-inclusive vacation and much more await. This Double Star Prestige room features a digital safe, a Smart TV entertainment center, an alarm clock with radio, a superior snack package, a coffee maker, and ironing tools. The bathroom includes a vanity sink, shower and bathtub combo, a hairdryer, and premium bath and body products. Complimentary WiFi: Get online any time with our wireless internet. Welcome gift: Receive a welcome cava bottle and fruit platter upon your arrival along with sets from Iberostar for children and adults. Private Check-in: A private check-in for guests and access to the exclusive members’ lounge. Superior Services: When you are ready to turn in for the night, the hotel staff will help prep your room for a peaceful sleep. Receive priority reservations for specialty restaurants when you book through the concierge along with access to premium wines. Find authentic peace in Iberostar’s adults-only SPA Sensations with complimentary access to the wet areas. Sports Package: Play a round of golf per 5 nights stay, per adult. If golf option is not available, receive one Swedish massage (30 minutes), per 5 nights stay, per adult.